Old Bollywood poster for sale of the Hindi film, Jhutha Sach (1984). 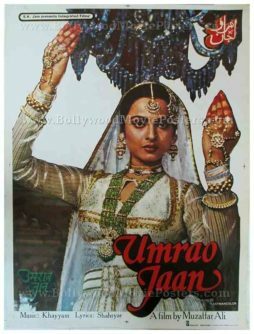 This is an actual surviving old Bollywood poster of the 1984 Bollywood drama that starred Dharmendra and Rekha in lead roles. 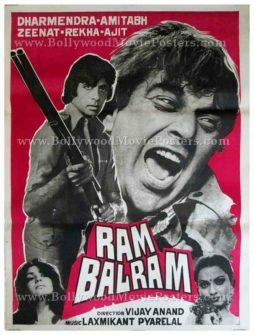 Printed and circulated during the first release run of the film (somewhere in the mid 1980s), this vintage Bollywood poster was designed and printed for publicity of the film but never ended up being used. 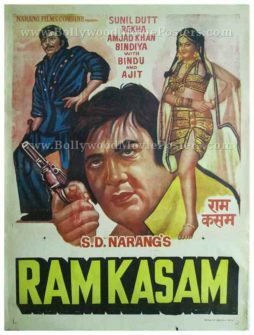 This vintage Bollywood poster was originally designed in hand painted oil on canvas format by Bollywood’s greatest movie poster artist, Diwakar Karkare. 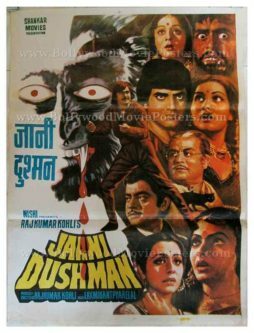 His printed signature is seen on the bottom right hand corner of this vintage Indian film poster. 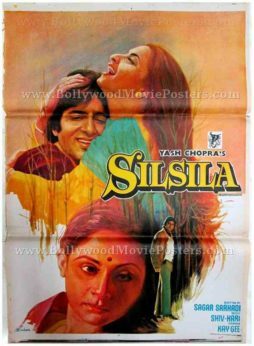 Typical of Bollywood poster painter Diwakar’s brilliant art style, this old Indian film poster features stunning hand painted artwork. The original He-Man of Bollywood, Dharmendra is seen prominently in this vintage Bollywood poster in a striking pose. Actress Rekha appears at the bottom in a superbly hand painted avatar. 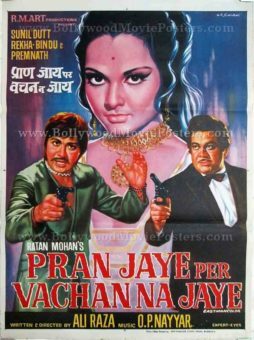 Typography used in this vintage Bollywood poster is completely in Devanagari Hindi. 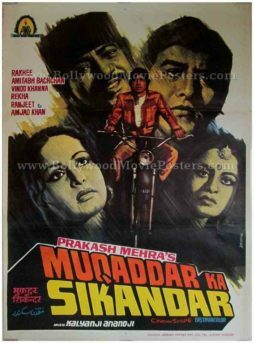 Old Bollywood poster of the blockbuster Hindi film, Muqaddar Ka Sikandar (1978) for sale. 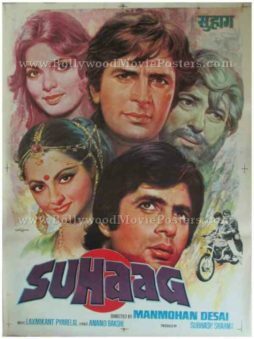 This is an actual surviving movie poster of the 1978 film that featured the greatest superstar of Indian cinema, Amitabh Bachchan in the lead role. 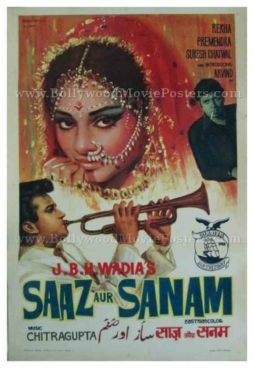 Printed and circulated several years after the first release of the film (somewhere in the early 1990s), this Bollywood poster was originally designed for publicity of the re-release of the film but never ended up being used. This poster was originally designed by cutting out images of actors from separate still photographs (shot on set location) and pasting them on a board. 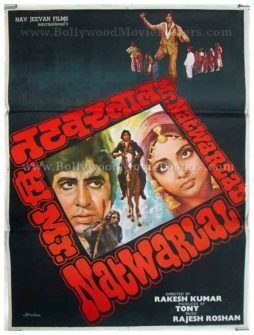 The typography is hand drawn / hand painted, which makes this Bollywood poster an interesting mix of two very different design techniques. In the poster, superstar Amitabh Bachchan is seen prominently in two different avatars – a close up photo of him holding a pistol is seen on the top, whereas a smaller photo of him riding his trademark motorcycle is seen below. Villain Amjad Khan is seen abducting actress Raakhee in a still from the film on the left. The typography used in this poster is in English. 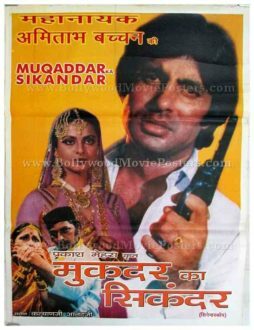 Old Amitabh movie poster of the blockbuster hit, Muqaddar Ka Sikandar (1978) for sale. 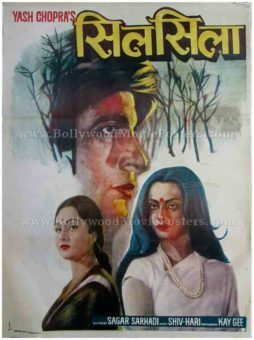 This is an actual surviving vintage Bollywood poster of the 1978 film that featured the greatest superstar of Indian cinema, Amitabh Bachchan in the lead role. This beautiful vintage hand painted Bollywood poster features a stunning portrait of Amitabh Bachchan in the center riding a motorcycle. Faces of the other stars from the film appear hand painted in an interesting brush stroke style, surrounding Amitabh Bachchan’s central portrait. The film’s title is seen translated in both Devanagari Hindi as well as Urdu at the bottom. 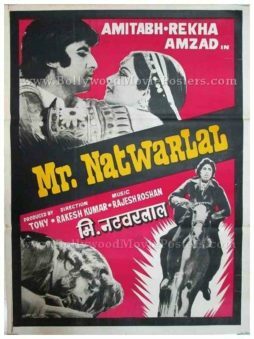 This old Amitabh movie poster has been graded as ★★ Restored for Display due to significant amount of taping applied to the back/reverse of the poster over its two folds. 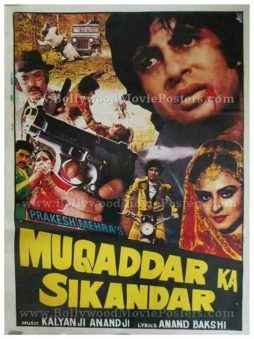 Old Bollywood movie poster of the blockbuster Hindi film, Muqaddar Ka Sikandar (1978) for sale. 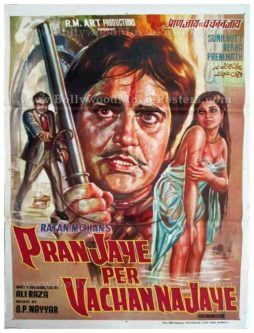 This is an actual surviving vintage publicity poster of the 1978 film that featured the greatest superstar of Indian cinema, Amitabh Bachchan in the lead role. 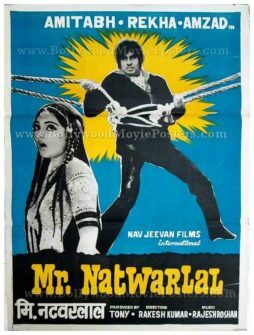 Printed and circulated several years after the first release of the film, this old Bollywood movie poster was originally designed for publicity of the film but never ended up being used. 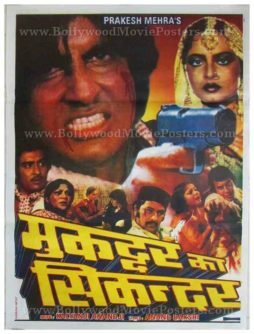 In the poster, Amitabh Bachchan is seen holding a pistol, with Rekha (who plays a dancer in the film) appearing on his side. Villain Amjad Khan is seen abducting actress Raakhee in a still from the film on the bottom left. The typography used in this poster is in Devanagari Hindi except for a translation of the title in English on the top. 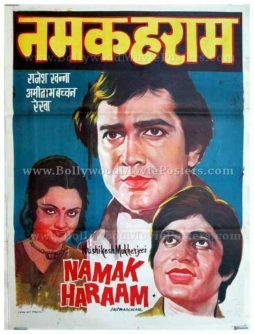 Capitalizing on Amitabh Bachchan's super stardom at the time, the poster credits Amitabh as “Mahanayak” or “Superstar” on the top in Devanagari Hindi. The film is believed to have created mass hype during its release – with people lining up for tickets (some even sleeping outside cinemas overnight). 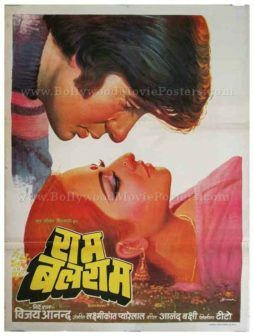 True to Amitabh Bachchan's super stardom, Muqaddar Ka Sikandar broke several box office records and became a golden jubilee hit. It was remade into a Telugu film in 1980. Similar to a few of his other films, Amitabh Bachchan plays the role of an orphan in Muqaddar Ka Sikandar. 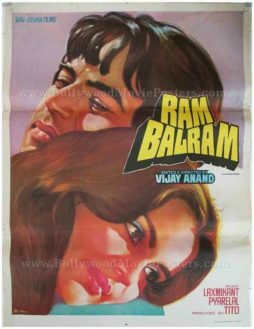 Highly collectible, hand drawn vintage Bollywood poster of the hit Hindi film Ram Balram (1980) for sale. 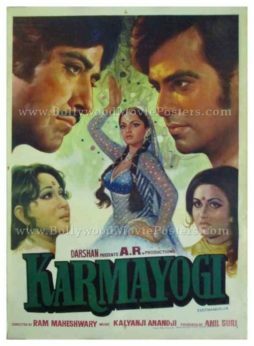 This is an actual surviving poster of the 1980 film that featured two of the biggest superstars in Indian cinema of the time, Amitabh Bachchan and Dharmendra. Printed and circulated somewhere during the release of the film, this hand painted vintage movie poster was originally designed for publicity of the film but never ended up being used. 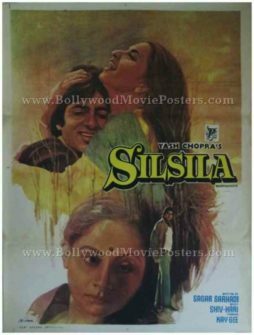 This poster was originally designed on a hand painted canvas by the greatest and highest paid Bollywood movie poster artist of all time, Diwakar Karkare, making it very collectable. The poster bears the original signature of Diwakar on the bottom right corner. 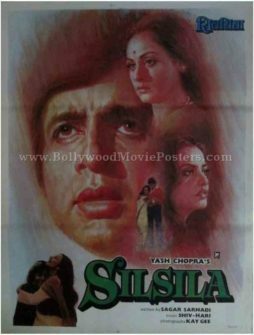 This beautiful hand drawn old Indian cinema poster was designed by the most sought after Bollywood movie poster artist in the country. 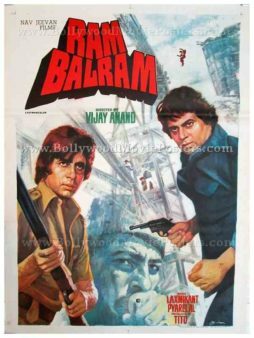 It features highly accurate hand painted renditions of the three key characters in the film – angry young man Amitabh Bachchan, the most handsome Bollywood actor of the time, Dharmendra, and Bollywood’s greatest villain, Amjad Khan.